The second installment of this year’s March Talent Showcase features Becky of Scrumptious Delight! Already known for making adorable plush toys, she’s branched out into customizing Blythe and sewing for the dolls we all know and love! Read on to learn more about Becky! Hello Becky! Please tell us a little bit about yourself. Hi, i’m a toy and craft loving mother of two human teenagers and multiple fur kids. I am originally from the UK but have moved around a lot and have been happily living in Vancouver BC for the last 8 years. Some may know me for making plush toys and soft sculptures. Back in the good old days of Flickr I first discovered Blythe as some of my plush friends would post photos of their dolls. When I search to find out more I found a wealth of photos and had a case of the need, want, must haves. It took me a while to get my first doll but once you have one it’s hard not to get her a friend or few! Right now I have Pumpkin (green haired TBL), Candy (My Little Candy), a Zinochika who is mid customization, and a Simply Mango and Simply Guava who are waiting to be customized. I recently finished customizing a Simply Mango into a Little Red Riding Hood for the show “a date with Blythe” the new Guava and Mango came along to replace her. I have a Pixie Peaceful and Nanas Little Lass middies, I love their size it makes them easy to take along with you. I also have a few petites including Fluff who I customized with cotton candy coloured hair. How did you start customizing? Which was the first doll you customized? The fear of customizing is real. It took me a long time to over come it. Way back I bought and customized a couple of Blybes to get some practise in I wouldn’t recommend it to anyone, hot screws in eyes to get chips out…nuff said. I then customized Pumpkin my TBL and Fluff my petite. Last year I was finally brave enough to customize a stock doll she was a Cadance Majorette who became Saphy Rose and went to “a date with Blythe” show. I hope to build confidence and improve my technique. There are definitely more petite customs in my future too. You’ve certainly jumped into the world of customizing! What are some of the challenges you overcame with customizing Pumpkin or Fluff? I guess the main challenge was overcoming the fear of carving. I still have a lot to learn, with each custom I try to carve a little more extensively or differently to get a feel for the plastic and learn where I can carve more deeply and how to create the shape I want. With Fluff the challenge was really her tiny size, I had to carve slowly and try and keep it all as symmetrical as possible. I know you also sew for Blythe and other dollies. With so many other Etsy shops and crafters out there, how do you make your work stand out? I don’t think I do, yet! There is a lot of cross over between plush and dolls and my plush work is fairly well know. I always assume that when people buy doll clothes from me that they found my store by some happy accident or that they were looking for plush. I do take pride in the quality of my work though and I hope that customers will find the clothes as well as my other items well made and will become repeat customers. My tiny cotton candies are the one doll item that I think people actually come searching for in my shop. People in the Blythe community are wonderful about sharing photos and tagging where various items come from, it’s e-word of mouth. 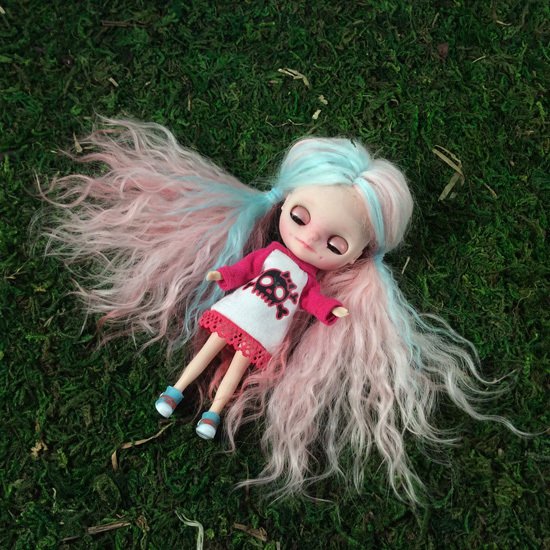 Your Petite custom, Fluff, sports a pretty amazing cotton candy coloured reroot! Can you tell us about your rerooting experience? Would you do it again? I would, I have since done an alpaca reroot on Boo the petite. The mohair on Fluff was a bit of a pain to work with, I didn’t enjoy having to wet the plugs to knot them. One mistake I did make was to make my plugs a little large when rerooting. I was very close to running out of space for the knotted ends, the scalp is stuffed full! The alpaca on Boo was really nice to work with and there was no need to wet the fibre at all. 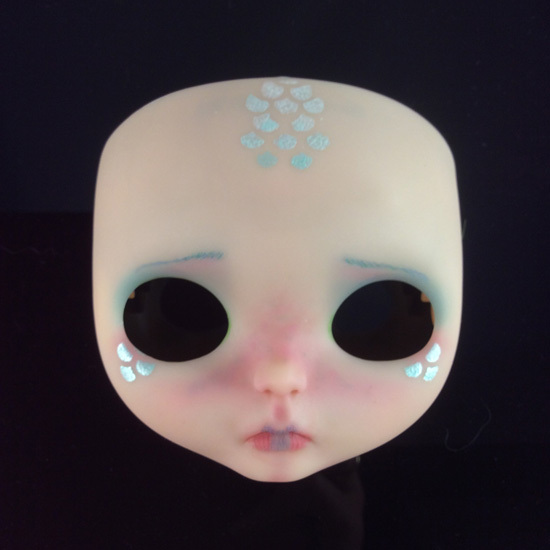 With your fingers in so many creative pies, how have you managed to incorporate your different skill sets together with your work related to Blythe? I am obviously pretty comfortable with sewing but I really enjoy switching things up a bit and trying out new techniques and mediums. The thing that draws me to Blythe the most is the possibilities she represents. 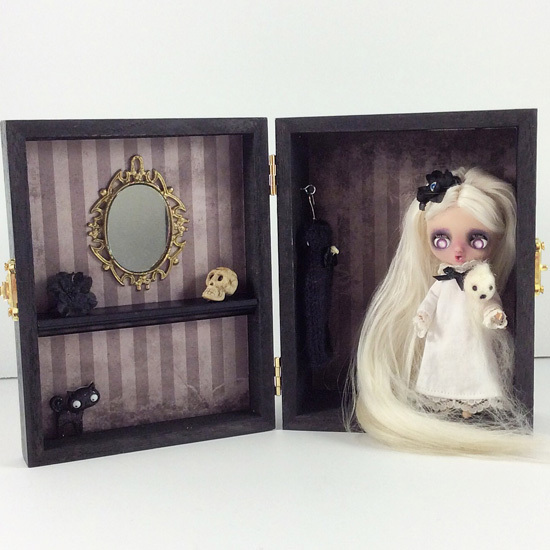 I really enjoyed making Boo and her little room box and all the different skills I had to employ to tell her story. 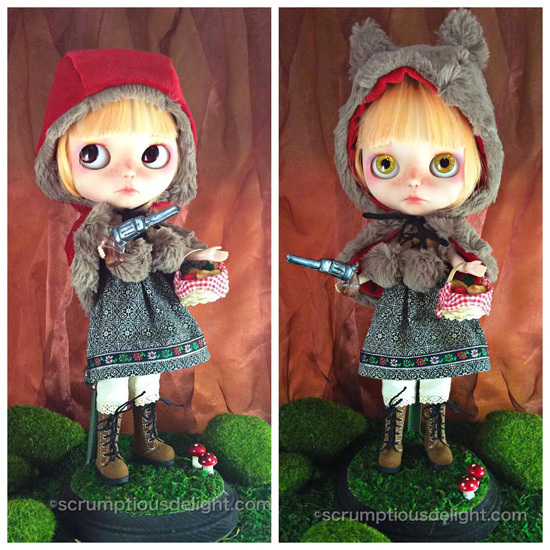 You created a Red Riding Hood-inspired custom for a charity auction recently, how did you get involved with that? What can you tell us about that project? I was contacted by Rhodora Jacob who is the owner of Tiny Dodo Gallery and organizer of the event. 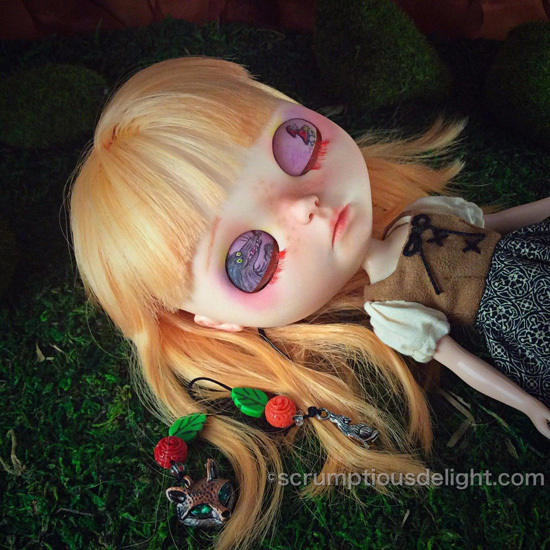 Rhodora was already familiar with my plush work and had seen some of my work on dolls on Instagram, I also customized a doll for last year’s event. 20% of funds raised go to the Seattle Children’s Hospital fund for uncompensated children, for this reason the theme and vibe of the dolls needs to be child friendly, nothing too gory or dark. This year’s theme was “Dark Woods” that would tie in perfectly with the work of the featured artist Irene Garcia of Sirenita Dolls. I felt quite inspired between the theme and the cause and chose to base my doll on the Little Red Riding Hood from Roald Dahl’s Revolting Rhymes. Roald Dahl was in my opinion the best children’s writer ever and being British I grew up on his books so I was in my happy place. In the revolting rhymes tale Red shoots the wolf and is seen three weeks later in the woods by the narrator wearing a wolf skin coat. I made her a reversible cape, red velvet one side and furry the other with detachable ears, held by magnets. On her eyelids and back plate I drew the wolf and Little Red Riding Hood in the style of Quentin Blake who illustrated Roald Dahl’s books. 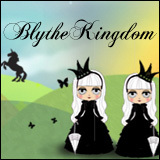 What do you enjoy most about creating for Blythe and the Blythe community? 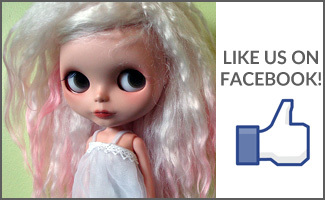 There are so many ways to customize and style a Blythe doll and so many people out there creating so many amazing things, it’s really very inspiring. I work from home and find myself needing new challenges and variety to keep things interesting. There are so many possibilities in creating for Blythe from customizing, making clothes and accessories to carry cases and room boxes, every work day can be different and new and exciting. The Blythe community is friendly and supportive. The best is meeting in person with others from the community. I love our meetings with the Vancouver Blythe Bunch, my daughter and I have found real friendships there and I can honestly say I haven’t never met a more friendly accepting group of people. Thanks for doing this interview with me, Becky! What advice do you have for someone who’s new to customizing? Don’t be too afraid, take your time and try to always work with a plan. Mistakes happen but most mistakes can be fixed or at least turned into something else. You can learn more about Becky and Scrumptious Delight on Etsy, Facebook, Flickr, and Instagram. Oh how fun to see yet another creative customizer with a hand in a lot of different crafty outlets for her love of dolls, period. 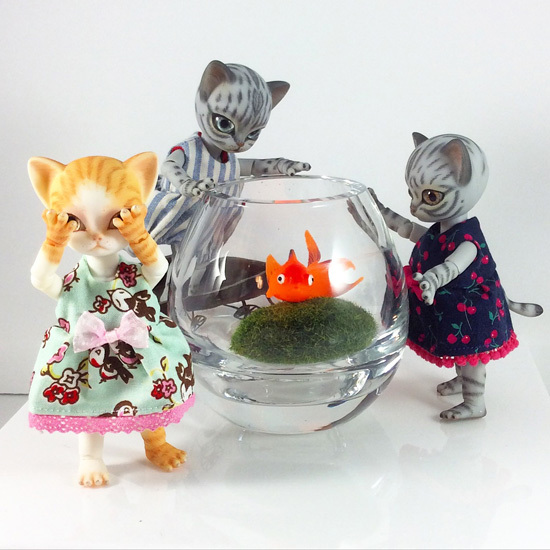 These showcases have sure inspired and shown me some fun people to look at and check out when I dive into my Blythe dolly funds. Thanks so much for sharing this creative soul with us! Becky’s work is scrumptious, I love the ‘Bag of marshmallows’ and the ‘Cotton Candy’. 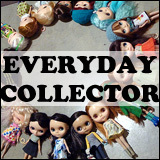 It sounds a bit daunting to customise a doll, but I still like to look at how others do it, and read your interviews. Oh my, such a talented customiser! This was such a fun interview to read! Her Etsy shop is just so much fun to look at, I’m having trouble deciding which monster to buy! I’m impressed by your customizing skills – I can’t imagine carving and painting such a tiny face as petite! The details on Red Riding Hood and Boo are amazing!